Miller Spectrum® 625 X-TREME™ Plasma Cutter with 20 foot XT40 torch has 40 amps of output power to cut through up to 5/8" mild steel. The unit offers easy connection to 120V or 240V input with Auto-Line technology and MVP Adapters. The 625 X-TREME now features the new Ultra-Quick Connect™ XT40 plasma torch and quick connect ground cable with heavy duty clamp. XT40 hand-held torch with 20-ft. (6.1 m) cable. Hi, is there an adapter or anything special to run this off if a trailblazer 325 efi? Miller Spectrum 625 X-TREME Plasma Cutter w/20 ft. Torch 907579001 would use Miller Power Adapter - Full KVA 230 Volt 300517 to run off of a Trailblazer. Can this run off a compressed nitrogen cylinder rather than a 6 scfm compressor? If so, what size cylinder for portability? 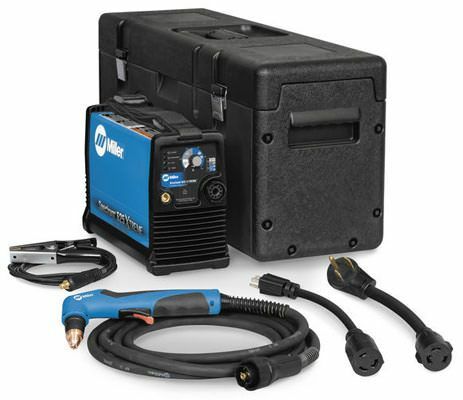 The Miller Spectrum 625 X-TREME Plasma Cutter w/20 ft. Torch 907579001 requires an air compressor that can provide at least 6 scfm at 90 psi..This will equate approximately to a 2 or 3 hp compressor..Before you purchase the compressor make sure that it can meet the 6scfm rating even though it may be a 2 or 3 hp model. What adapter is needed to run this machine off a Miller 250 bobcat? In order to run a Miller Spectrum 625 X-TREME Plasma Cutter w/20 ft. Torch 907579001on 230 volt off of a Miller Bobcat 250 you ill need a Miller Power Adapter - Full KVA 230 Volt 300517. Hello, if I purchased this machine from you. how long of warranty do I have. The Miller Spectrum 625 X-TREME Plasma Cutter w/20 ft. Torch 907579001 comes with Miller's 3 year warranty. The Miller Spectrum 625 X-TREME Plasma Cutter w/20 ft. Torch 907579001 can be up graded to automated cutting with the addition of the Miller Automation Kit # 301158 ($258.23). Depending on the CNC system you are using you may also need to purchase a XT 40 machine torch. Cyberweld made the purchase process very easy. The follow-up was quick and most helpful. ProsGreat process, helpful staff, prices were the best. First plasma cutter and this thing is small and built well. Really love it. Very impressed with size of the machine and how easily it is to initially setup and put to use. Looking to set up for a plasma table using the automation hit. This machine cuts very smooth through 1\4" steel plate with no problems. Very easy to start using right out off the box. Great size of tool.... very small with lots of punch from this size. I bought a 625 as my first plasma cutter. I had limited experience but a project i was working on was going to require a lot of metal cutting. It took about a month for me to get nice straight cuts in 1/8 " cold rolled sheet steel, but compared to using an angle grinder this saved me untold hours. A great tool. The fact that it uses 120V and 230V is a clutch feature. ProsDone everything I've needed it to so far. System cuts much cleaner on 220V circuit with 40AMP tip than 115V with 30Amp tip. Tried on both 1/8 and 1/2 and no stops, cuts fast and steady. Aluminum is a bit more difficult since it does not stay fluid as long as steel, I need to read up on cutting aluminum to learn how to keep it clear from cut. ConsCompressed air filer not included, had to order separately the day I received the unit. Instructions not clear on how drag tip is utilized if you are new to plasma cutting. I can't believe how something so small packs such a punch. I just love it in the shop. Haven't taken it out on portable yet but sure I am going to like the weight of it. CyberWeld - Great place to buy your next welding supply! The CyberWeld staff is friendly, honest and very easy to contact. NO run arounds here. They also stock what they sell. That is why I will always buy from them. No time consuming drop shipments that you cannot trust. The Spectrum 625 is turning out to be the best plasma cutter that I have used. It is small, lightweight and POWERFUL. The control panel is clearly marked and easy to understand. My favorite features are the flexible torch cable and input power cord. It's so nice to be able to use a machine without fighting with super stiff cords. I have to wonder if the designers of welding machines ever were forced to use them. Must be the designer of this machine got a taste of those stupid stiff cords. Thanks Miller, home run with this unit.